The small energy efficient air conditioner retails for around $800 and requires a licenced electrician to do the installation. The cheaper oil-filled column heater uses 2,000 watts of electric energy during heating cycles. The more energy efficient air conditioner uses only 450 watts during heating cycles and provides 25 percent more heat with that electricity. 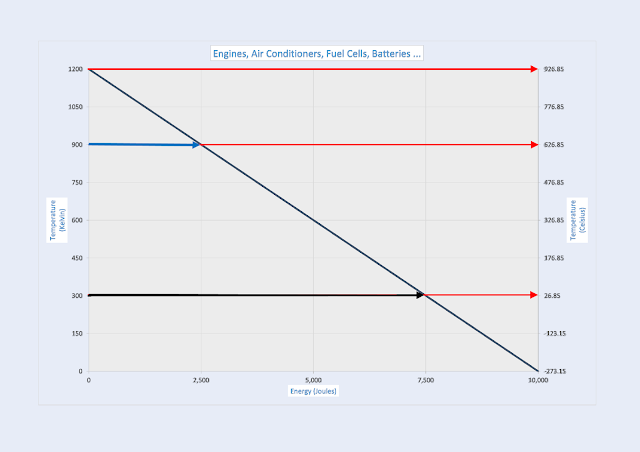 The more expensive and more efficient air conditioner that can operate for 5 hours with just 5 times 450 watts which is just 2.25 kilowatt-hours of available battery energy storage. The answer will depend on the cost per kilowatt-hour of battery storage. When buying battery storage for your home systems don't forget to check on the availability and price of more energy-efficient appliances. You may be able to lower the purchase cost and make more savings by replacing some older appliances at same time. Bad news stories of air conditioners driving up peak electricity demand during heat waves abound. The good news is that using an air conditioner to heat your home in winter uses only 20 percent of the electrical energy of an electric heater. So if you are using electric heaters to keep warm and are concerned about your electricity bill - there is an alternative available that will cut that heating bill by 80 percent. 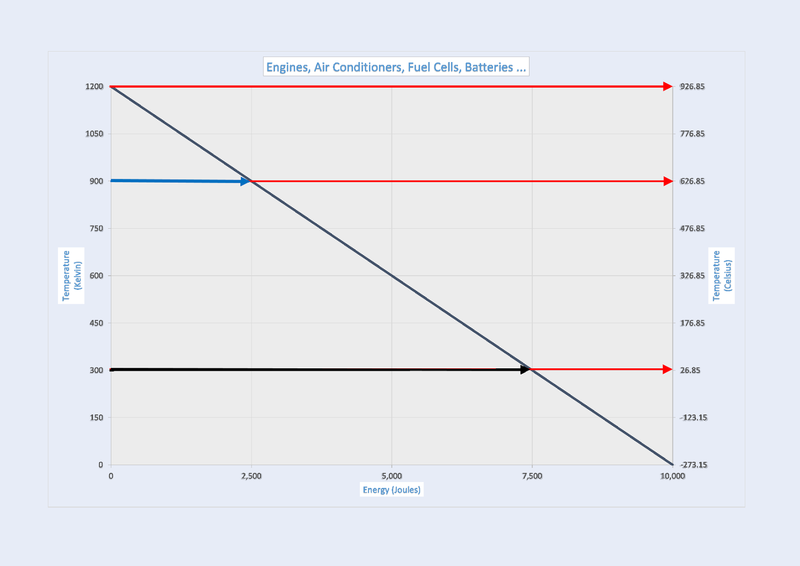 These two diagrams illustrate why air-conditioners are so much cheaper to run than electric heaters. The performance of air conditioner systems for heating is available at the Air Conditioner Energy Ratings government website. "If you produce only heat from woodchips you have an energy efficiency of more than 80 percent"
The same can be said of burning wood pellets, natural gas, heating oil or any other fuel to heat your home. It looks like a good proposition - obtaining more than 80 percent of the energy content of the fuel as useful heat. It is not the best that can be done however. 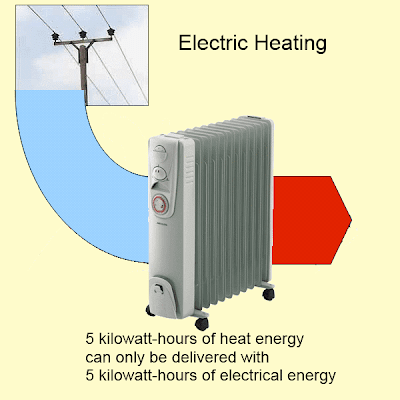 If the heat energy in the fuel is converted to electrical energy at 50 percent efficiency then each 1 kilowatt-hour of heat energy can produce 1/2 kilowatt-hour of electrical energy. 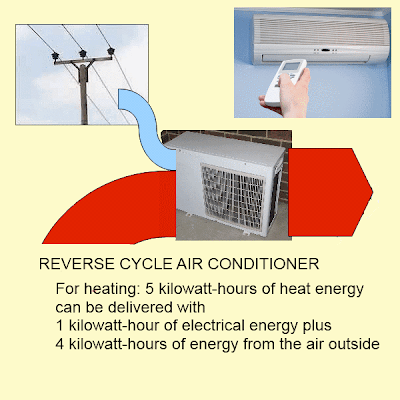 If this is used in a reverse-cycle air conditioner to heat your home, you obtain 5 times 1/2 kilowatt-hour (that is 2 1/2 kilowatt-hours) of heat energy for each 1 kilowatt-hour of heat energy in the fuel. Burning high-quality fuels such as natural gas for heating is an unnecessary waste of energy resources. Innovative design can be spurred by scientific understanding of energy storage and transformation. This diagram represents current scientific understanding of how energy may be stored and transformed. A power station can theoretically convert 10,000 joules of thermal energy at 1200 degrees Kelvin into 7,500 joules of electrical energy and 2,500 joules of thermal energy at 300 degrees Kelvin. It is also theoretically possible to decompose some chemical compound into its constituent elements with 10,000 joules of thermal energy at 1200 degrees Kelvin and produce 7,500 joules of electrical energy and 2,500 joules of thermal energy at 300 degrees Kelvin in a fuel cell that recombines those elements into the original chemical compound. If it is cheaper and more reliable to construct a machine that operates at a temperature of just 900 degrees Kelvin instead of 1200 degrees Kelvin, then this machine could theoretically decompose the chemical compound into its constituent elements with 2,500 joules of electrical energy and 7,500 joules of thermal energy at 900 degrees Kelvin. At some later time the decomposed elements could be used to produce 7,500 joules of electrical energy and 2,500 joules of thermal energy at 300 degrees Kelvin in a fuel cell that recombines those elements into the original chemical compound. The graph above is a representation of scientific knowledge from which these observations can be made. Carnot's equation for efficiency of heat engines. Nernst's equation for electrochemical reactions. Gibbs-Helmholtz's equation for chemical reactions.